* A more complete version of this motto, consisting of two verses, is also quoted by Elisaeus Malacrida on p. 145. 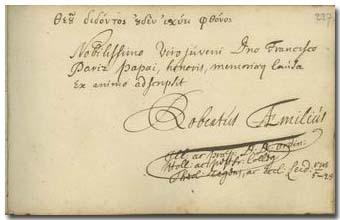 Robertus Aemilius was born on January 29, 1663 in Oud-Beierland (Zuid-Holland), a son of Gerard Aemilius. He immatriculated in 1683 at the faculty of theology of Leiden, and was influenced first of all by the Cartesian Christoph Wittich (1625-1687). From 1688 he was a preacher in Nieuw-Beierland, from 1700 in Delfshaven, and from 1702 in Leiden. In 1707 he was a subregent of the Staten-College, and from 1709, following the death of the regent Petrus Hollebeek (1646-1709), he became his successor. After the death of his wife in 1711 he married Mary van Rouveroy, daughter of his colleague Johannes van Rouveroy (1670-1720). He died on March 17, 1729 in Leiden. He was a mild personality, who avoided conflicts. His two sons born in his first matrimony, Gerard and Cornelis, also became pastors. His works: ’S Werelds ontstandvastigheit, 1709. – Het licht der waerheit, doorstraelend in de leere der hervormde kerke. Leiden, 1715. - Kort ontwerp van Het licht der waarheit. Leiden, 1720. Four days after the note of Robertus Aemilius his father-in-law, Johannes van Rouveroy also wrote in the album (p. 231).